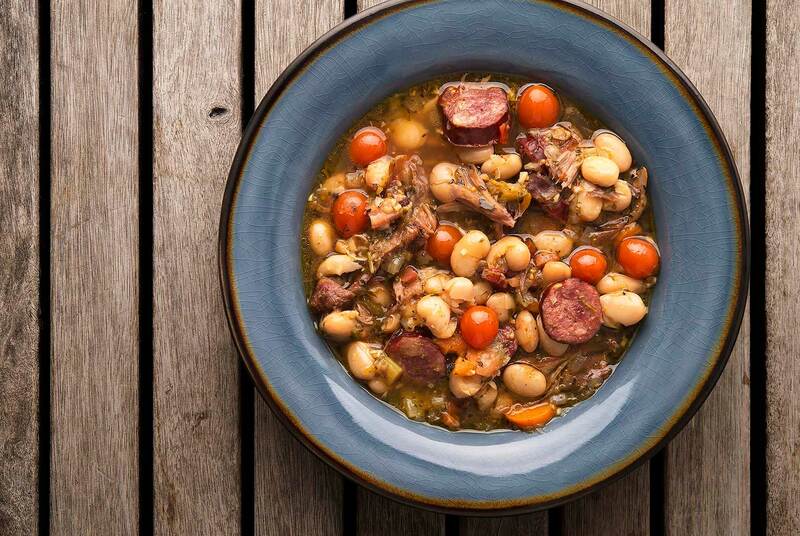 If you’ve never heard of the French stew cassoulet, you’re missing out. It’s a hearty stew — some would say a gut bomb — made up of beans and many kinds of meats, some smoked, some confited, some in the form of sausages. This turkey and bean soup is a riff of that idea, but much lighter. by Ronni Lundy. She in turn learned it from Shelley Butcher of the Dancing Bear Appalachian Bistro in Tennessee. What you see here is my take on it, loaded with lots of wild game. 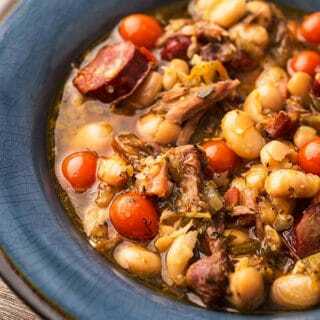 The essence of this soup, or stew, or casserole, depending on how much broth you want to serve with it, is the use of good beans and lots of varied meats. Ronni’s uses bacon, salt pork, chicken-apple sausages and rabbit confit. Mine uses bacon, a Toulouse-style duck sausage and wild turkey thighs. No matter what you choose, you need something smoked, some sort of sausage and a meat that will break down into tenderness with slow cooking. 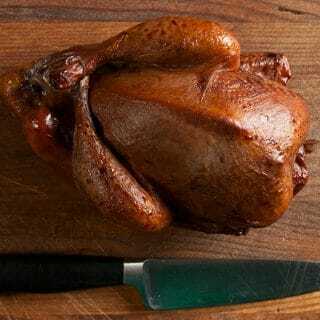 Turkey thighs and drumsticks are a good choice here, but so would rabbit, pheasant legs, squirrels or pork. A word on the beans. What attracted me to this recipe was Ronni’s use of fresh “shelly” beans, which are fully ripe beans that are not yet dry. I happened to have access to excellent cranberry beans in this state. Shelly beans have a different texture from dried, a touch more vegetal and less meaty. But fully dried beans are fine, and are what the French use. A final touch is the use of cherry, grape or other small tomatoes. I really like what they do for this soup. Bright, colorful little bursts of tart flavor that play off the richness of everything else in the bowl. Other tomato additions would not have this same effect. You make this recipe in stages. Each thing gets added to the pot in due time, not all at once. Follow this rule and you will be very happy. Break it and you will have a muddied, undifferentiated mass in a bowl. Still OK, just nothing to write home about. 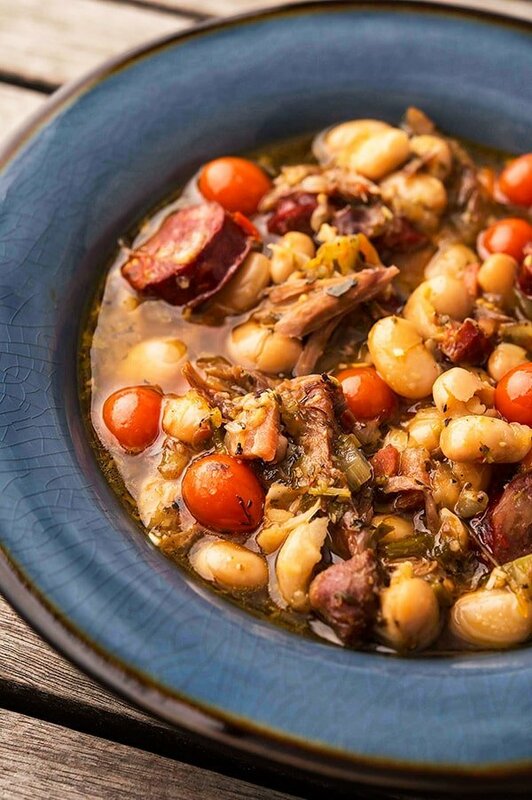 This is a sort of Southern cassoulet, a hearty mix of beans and meats good for cold days. As I mention above, the meats you use can vary, as can the beans. In a large soup pot like a Dutch oven, cook the bacon over medium heat until crispy. Remove the bacon. Eat a slice, then chop the rest and set aside. Preheat the oven to 325F. Brown the turkey thighs in the hot bacon grease, turning as needed. Remove and set aside. Add the carrots, onions and celery and cook until soft, about 6 to 8 minutes. Add the garlic and cook another minute or two. Return the turkey thighs to the pot, add the stock along with another quart of water. Add the beans, thyme and bay leaves and salt to taste. Cover the pot and set in the oven for 2 hours -- 90 minutes if you are using store-bought turkey. Check the turkey to see if it's tender. When it is, fish the thighs out and debone, then chop and shred a bit. Remember you will eat all this with a spoon, so that should guide you in terms of size. Return the turkey meat to the pot. Add the sausage, tomatoes and honey to the pot and stir well. Add more salt if you need it. Return to the pot and set back in the oven for 15 minutes. When you are ready to serve, stir in the parsley and reserved bacon, along with lots of freshly ground black pepper. You can find all sorts of recipes for wild turkeys and other upland birds here on Hunter Angler Gardener Cook! I wonder if this would freeze well? Lance: It does freeze well. I was always told that thighs and legs were too tough to fool with on a wild turkey but those guys don’t know what they are missing. It hit the spot tonight. Nice! I make something similar to this. Since I usually make it in the spring I add young nettle greens to it for the last 15 minutes.